Sometimes the best vacations are the ones spent with a group of people who are closest to youthe cousin you grew up with, the neighbors you clicked with and basically raised each others children together, the college friends who knew you way back and still like you now. These people are the backbone of your life, why wouldnt you want to go on adventure with them? Our Reunion Vacation Homes four bedroom Orlando vacation rentals with private pools are large enough that each traveler has space to breathe, but also allows them to come together for communal meals. The kitchens are large enough for multiple chefs. You can also enjoy crazy fun spent frolicking by the pool. If you dont have your own pool at home, you will rapidly begin to understand the attraction! Anyone who has previously stayed in a Reunion home might be expecting a certain level of quality and style out of their home, and they would be right. From your first glance of the stucco and tiled roof of the exterior as you drive up the cobblestone driveway to the final glimpse in your rear-view mirror as you reluctantly drive away at the end of your stay, THIS will be the model of your ideal vacation home rental, not just in Orlando but everywhere you go for the rest of your life. Wood, tile, and plush carpeted floors throughout, cool granite countertops, and the warm colors on the walls are just some of the details that show our commitment to quality. Gourmet chefs kitchens, spacious living areas with high-end furnishings, and large bedrooms that are sanctuaries of peace and tranquility invite you to come in, sit down, and relax. Youve had a long trip and we want to take care of you! This is going to be a vacation that is all about you and your needs. Dont you deserve it? You could spend your entire vacation exploring the playground that is your Reunion Vacation Homes rental, playing pool in the game rooms, swimming in the pool in your private backyard, or sitting on your covered terrace enjoying a glass of wine as the sun sets in a blaze of vibrant and fiery colors. 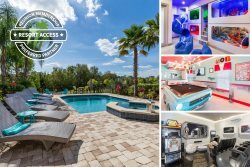 As fun as our Orlando vacation rentals with private pools can be, you may want to venture out to explore the world famous attractions in Orlando! For those times, you will soon discover that Orlando offers more than Disney. Take in a Blue Man Group Show or drop in the Blue Martini for a sophisticated evening of fun and drinks. Put on your hiking shoes and explore the Bill Frederick park, or put on your shopping shoes and head to Zou Zou and check out the shoes they offer there! Theres always something to do in Orlando! Grand Jewel | Luxurious 4 Bedroom Pool Home | Amazing Location! Fairway Ridge Deluxe - New Games Room - Pool Table & PlayStation 4!